On Saturday night, the city of Baltimore resembled a warzone as protests over the death of Freddie Gray turned wildly violent. One eyewitness reported watching the streets around him and his friend “turn into madness” as they left a baseball game between the Boston Red Sox and the Baltimore Orioles. 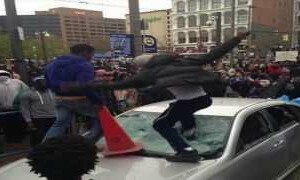 Car windows were smashed, stores were robbed, chairs were thrown and large numbers of random bystanders were attacked. One prominent Democrat claims that those committing the violence were “mainly from out of town“, but how would he know that? Today, there are approximately 2.7 million people living in the Baltimore metropolitan area. It is an area that has been known for poverty, crime and drugs for many years, and as racial tensions continue to increase in this country it is a powder keg that could erupt at literally any time. We got a preview of what can happen on Saturday night. If this is how people will act while economic conditions are still relatively stable in this country, what in the world is going to happen when things really start falling apart?